Ozy the octopus, currently at the Island Bay Marine Education Centre in Wellington, New Zealand, may have just set a new record: he is the first octopus to unscrew a closed jar in under a minute. Earlier this week, the keepers timed Ozy, the fastest unscrewer they'd ever seen, and were amazed when he managed to get to his crab lunch in 54 seconds. Ozy is only temporarily at the Centre; according to Practical Fishkeeping, he was brought in with a "badly damaged" arm, possibly due to an attack from an eel. He's healing nicely, though -- luckily for him, octopuses can regrow their arms. 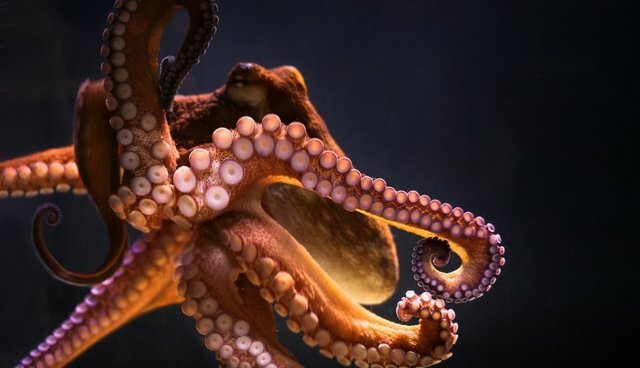 Octopuses are known as some of the most intelligent animals on the planet: they use tools, they have personalities, they exhibit play behaviors. (This story investigates the decidedly impressive intelligence of the octopus.) They're the only marine animal that can open a jar, as the combination of perception and force needed to unscrew a lid is beyond the reach of almost any animal. Some have even managed to open a push-and-turn childproof bottle. Giving an octopus a closed jar isn't just for our amazement. Octopuses hunt by scrabbling along the sea floor, overturning rocks and cramming into small places to pry out shellfish to eat. In captivity, keepers often place a crab or some other food inside a jar, so the octopus can simulate its natural hunting behaviors when it unscrews the top and fishes the crab out. Octopuses are problem-solvers who need puzzles to keep their active minds satisfied. That's even more important for Ozy, since he's due to be released back into the wild in a few weeks -- he can't lose his knack for hunting. Hundreds of millions of people visit zoos every year, despite increasing public anxiety about animals in captivity. If you want to make sure you're at least visiting a zoo that makes efforts to be humane, make sure it is on the list of U.S. facilities accredited by the Association of Zoos and Aquariums; internationally accredited facilities are listed hereby the World Association of Zoos and Aquariums. If you want to see whether a facility has any recent USDA violations, you can search this database. You can report a zoo or aquarium to the USDA here. And if you want to become active against having animals in captivity, Peta and Born Free USA offer places to start.